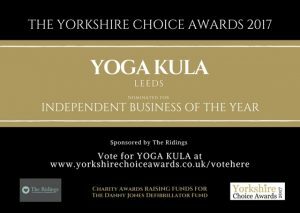 We are so excited to let you know that Yoga Kula has been nominated by the Yorkshire Choice Awards 2017 for Independent Business of the Year 2017. When the Yorkshire Choice Awards 2017 contacted us to let us know we had been nominated we were truly honoured to be recognised by such an incredible awards body that celebrates achievement in Yorkshire. As we approach our 5th Birthday next year we believe Yoga Kula has evolved into a beautiful place for our community to come together and celebrate yoga. We can’t wait to see what 2017 has to offer as we look to develop our retreat programme, extend our workshop offering and finalise the details for our 2018 teacher training programme. If you have any suggestions on what you would like to see on offer at Yoga Kula next year please get in touch. Votes are now live so if you would like to see Yoga Kula win Independent Business of the Year 2017 here’s what you need to do. Place your vote at this link. Remember it is a public vote so if you can share with your family and friends we have more chance of winning. Voting closes on 1st March 2017. The Yorkshire Choice Awards are a celebration of achievement in Yorkshire. The Awards organisers told us that ‘Yorkshire thrives on inspiring businesses like Yoga Kula’ so here’s to celebrating more incredible businesses in Yorkshire over the coming years. Singer Lizzie Jones is spearheading a campaign, The Danny Jones Defibrillator Fund, to raise funds for equipment that could prove the difference between life and death at Rugby League clubs across the UK. During the Awards Gala Dinner, we will hear from Lizzie Jones as she introduces The Danny Jones Defibrillator Fund and then later performs for us to close the ceremony. The winners will be announced at the dazzling award ceremony on 1st April 2016 at The Centenary Pavilions at Leeds Utd. Nominee’s, guests and the general public will need to secure their tickets to attend on the evening. If you would like to attend the awards ceremony buy your tickets here.